Powered by some of the biggest software developers in the business, G' Day Casino guarantees a rich selection of pokies with a wide variety of themes, styles and features that include massive progressive jackpots. A good day of online betting has to start with a welcome bonus and G' Day Casino has this covered. When it was launched in 2013, the site was clearly designed to bring a piece of Australia to players from around the world and its Curacao license gave it access to most countries. Being approved by the UK Gambling Commission means that players from the UK can enjoy the variety of pokies presented here as well and everything is just a click away. This combination of hot slots and big bonuses also made the casino very big in Australia. Even the logo has a kangaroo on it and the background image shows the Sydney landscape. Additional Australian touches are added throughout the website but the games will quickly become the ones demanding all the attention given the big providers available, such as NetEnt, Quickspin, Betsoft, NYX, Amaya and more. The welcome bonus mentioned just a bit earlier in the G' Day Casino review is an awesome way for new players to get going. First of all, simply registering from any of our links will land you 50 free spins without even having to make a deposit first. These can be used on the hit slot Guns n Roses from NetEnt. When you do decide to make a first deposit, the casino will match it dollar for dollar up to an unlimited amount. The second deposit will then have a 25% bonus up to $500 and the third bonus will be of 50% for up to $500 free. An ongoing 10% deposit bonus will be applied on every deposit made at G' Day Casino for up to $50 a day and there are weekly casino promotions that can offer extra funds and free spins. A notable promo here is the Cash Attack offer where bets placed on games with this function activated have the potential to award additional cash prizes. Given the list of software developers, you can expect to find an impressive collection of games at G' Day Casino. This is especially true when it comes to pokies but also covers table games, video poker, specialty games and more. The instant play lobby on the site is great for browsing the collection since there is no software to download. Whenever you don’t have access to a computer or just don’t want to be sitting at a desk, you can still have a good amount of casino games available on G' Day Mobile Casino. Just by going to the website from a smartphone or from a tablet, players will get a simplified version of the site that lists all the available games right away. These are grouped for easier access and it is simple to just scroll down and tap on one to start it. Directly compatible devices are the ones running Apple iOS 4.0+ or Android version 2.3.5+. This easily covers the newer iPhone and iPad, as well as the Samsung Galaxy series, HTC smartphones and other brands. Blackberry is also on the list since it runs Android and given the fact that the compatibility mostly depends on the web browser, players using a Windows phone will have access to the games as well, be it for real money or just for practice purposes. There are quite a few games available at the mobile casino right now and they look superb on the modern touchscreens. Tapping on one will start the demo mode if the player is not logged in and this is a great way to see the small differences in controls between the desktop version and the mobile one. Of course, it is possible to login with the same account if you are already registered and not only will the same promotions be available but the cashier will also display several banking methods. In addition to going directly to the site from the mobile device, the casino also provides an option to receive a text message with the link. Crossplay: Yes, the mobile casino details match the desktop ones. The mobile casino and the desktop version of G' Day work very well together and they share the same bonus. This means that players who register from their smartphones will still get 50 free spins and then an unlimited 100% bonus on the first deposit, followed by two more bonuses. It really is easy since all you have to do is go to the website. You will not have to download any additional apps as long as your browser plug-ins are up to date and you can fire up any game by just tapping on it. You have just won your first prize at G' Day Mobile Casino! Quick Tip: If you want to skip the part of entering the URL every time, you can just add the site to Favourites and it will show as an icon on the device. Currencies are not just limited to Australian Dollars but also include US Dollars, Canadian Dollars, British Pounds, Euros, Swedish Kronor, South African Rand and Norwegian Kroner. 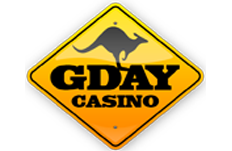 G' Day Casino has an Australian theme and is very popular Down Under but this doesn’t mean that it is only available in English. Players from European countries are welcomed as well and to make their experience more pleasant, the site is available in Norwegian, Finnish, Swedish and German. The preferred option can be selected from the flag in the top right corner. The customer service is first class and it is available at any hour of the day by email and by live chat. A phone line is not provided at this time. After talking about the many pokies offered, it is good to point out the fact that there are many other categories for casino games. Players who prefer table options will find about a dozen games that don’t include blackjack or roulette because these two have their own separate categories. The live casino from NetEnt and other providers is a must to try out given the beautiful dealers and the authentic casino gaming experience provided. And for more alternatives there are scratch cards and other instant win games which can have themes of popular slots to make them look more familiar. Every slots player has dreamt about winning a huge progressive jackpot and this is possible at G' Day Casino. Some of the biggest titles from NetEnt have prizes that exceed one million Australian Dollars and the biggest one is Hall of Gods with its multi-million jackpot that keeps getting bigger. All in all, G' Day Casino is one of the top choices in Australia. While it has some flaws, the collection created from several software providers is outstanding. There is a rich variety that comes from the big developers when they present their biggest titles on the same website. And to make the large list of pokies more accessible, the casino is offering a great welcome bonus and plenty of promotions to follow it. The no-download platform is great and its mobile version is even better. There is nothing better than playing a hit online slot from a smartphone and winning big prizes while enjoying the detailed theme. Plus, if there are ever any questions, the support team will handle them straight away. Play at G’ Day Casino with your $450 Bonus Now!